Once again, I completely agree. 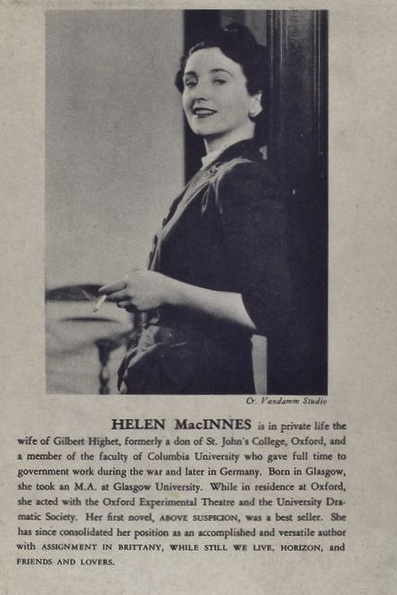 I started reading MacInnes as a teen and preferred her over LeCarre etc. This one is a weak effort in comparison — I much prefer Hidden Target, for example. Just read for the first time “Rest and Be Thankful”, a surprising find in my library’s giveaway cart. 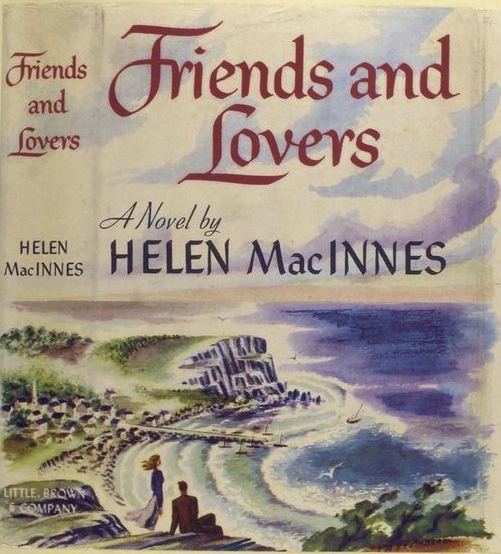 As a young reader of Helen MacInnes my favorites were titles like “Friends and Lovers” and “Assignment in Brittany,” those that had a more developed love story. On a whim decided to search for RABT and found your site. Despite my delight in finding a fellow spirit cannot agree with your relative ranking of the two “pure” romances. While I recognize that much of your assessment of the two main characters in FAL is true, to me it was a much more vivid experience of a writer’s journey to unite two characters. RABT is a more gentle read, with a less believable setting, and taken up much more with the characterizations of the various NY authors and the relationship between the two women. I am at heart a lover of romance, both high and low unfortunately, and to me in that regard there is no comparison between the two. Hi June, I am so very glad you were moved to comment on my post. And yes, I see what you’re saying. FAL is much more a truly “pure” romance, dwelling on the interactions between the two main characters and their inner thoughts and feelings as their relationship develops. RABT is something of a social satire; much more playful; which is likely why it appeals to me more than FAL. The love story in RABT (well, all the love stories; there are multiple pairings-up going on 🙂 ) is much more of a side note; I would say that the deepest relationship portrayed is that of the two main female characters; their love for each other is deep but definitely platonic. That novel (RABT) is a much lighter read; not as challenging and with less depth than FAL. And though we differ an the relative rankings of these two stories, isn’t it wonderful that we both agree on the Helen MacInnes’ merit as a writer! I am from India and in my teens in in 1970s I read this book, had it with me for years, and but, after joining work force, marriage and kids and a different life in another place, the teenage collection of books was lost. This book was one of my favorites, for no other reason but to read that sweet little passage on “niceness”… I am Vinita and my name means polite… And I always remembered that passage as defining some of me,.. So if any one has that book, and and can cite that passage I will be obliged!